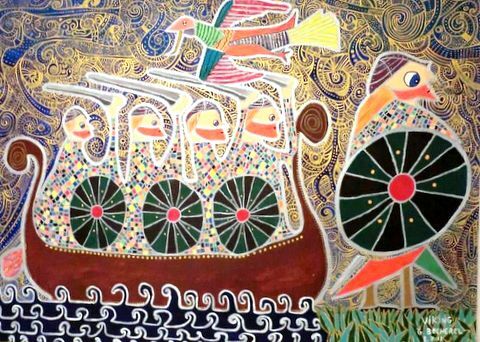 The year 795 AD saw a new force arrive on the Irish political scene, the Vikings. These seaborne warriors were to have a significant impact on Irish life. Their attacks on religious centres and propensity for warfare are well documented, as is their contribution to the development of urban centres and new trade routes. However, something which is sometimes over-looked is their input, albeit small, to the Irish language. Unsurprisingly, considering the Viking’s seafaring roots, the majority of these words are associated with nautical activities. They include the Irish words for a boat (bád), as well as various parts of the sailing vessel, such as the anchor (ancaire), rudder (stiúir) and sail (scod). Fishing terms of Norse origin are also found, including the Irish words for fish such as cod ( trosc) and ling (langa) as well as for a fishing-line (dorú/dorgha). Facilitated by their naval expertise, the Vikings also excelled in trade. This is reflected in the Irish word for a market (margadh), which is borrowed from Old Norse (markadr). Similarly the Irish word for a penny (pinginn) is derived from the Norse word penninger. This latter example is not surprising, as the first person to mint coins in Ireland was the Hiberno-Norse king of Dublin, Sitric Silkbeard. A number of additional words are listed below. Thanks Robert, I didn’t realise that. Great that it’s accessible on-line. Also Norse sker as in Skerries – Dublin and Portrush – and Skerranrone – just west of Giants Causeway. Thanks for sharing Nevin. There are a good few place names alright, and like Skerries mainly coastal. Wexford, Arklow, Waterford, Smerwick, Satlee islands Lambey island, to name a few. Osterhafn (Oysterhaven), Olderness (Old Head), Edelfiord (Kinsale Harbour). So this “Oster” is not related to the Germanic “Ost” for east ? Oysterhaven is east of Kinsale, but mostly south of everywhere else. The Norse word for a sweater/ganzie, possibly worn by seamen, is genser; the Irish is geansaí. Is that a Norse thing or a common ancestor of both languages? It was interesting to see bád referenced there. I always thought “long” (Irish for ship) might have a connection to “long boats”. There are many more Irish, Manx and Scottish Gaelic words of Norse origin (amd plenty not related to maritime activities) but David Greene in 1978 attenuated this view about bád, stating that it is impossible to tell if it is from Norse bátr or Old English bāt (boat). And, IIRC, there is a strong chance that ‘long’ is from Lat. Navis Longa. Cony in Shakespeare, Konijn in Modern Dutch. Ezel in Modern Dutch, Osyel in Russian. Both are, I would think, from a common ancestor, though if memory serves me correctly the rabbit was introduced to Ireland by the Normans. Is it known if any/many Gaelic words made it into the Norse language? Many slaves were taken from Ireland and Scotland back to Scandinavia, as well as hundreds of years of trade and intermarriage, so there was plenty of opportunity for crossover. ‘long’ and Welsh ‘llong’ come from the Latin _navis longa_, ‘long ship’ = ‘warship’. my surname is of viking origin but is derived from gealic ,if you know any one named McGuigan the name was originally an anglicized gealic name Mag Uiginn which means son of viking. Ol for beer, ag ól to drink.